Now it’s time for RUMORS FROM THE LOT! So last week we had some scouts in the area, and rumor has it, one group of folks were scouting for a $35 million feature. But don’t get too excited yet because from what I hear these folks are waiting to see what our legislators do before choosing to come to Wilmywood. The House has put in for $40M beginning on July 1st for this fiscal year and next. Now we wait to see what the Senate will do. So, it is not a definite 40 yet. Right now the cap for a feature film is at $5 million. If that feature was shot entirely in NC, 25% would be $8.75M, so I am hoping the Senate will raise the cap. So far, no one in the NCGA has made any changes to the language of the film grant which REALLY needs to be done. The other scenario of course is that they would only shoot a portion of it here in North Carolina. If that’s the case, they would possibly get their full 25%. Now with all that being said, they were merely scouting, so we shall see what happens. From what I heard there was more than one production scouting, but I can’t tell you who the others were. Right now, we are losing around 40 crew members per month to other states due lack of work, so we need to get this ball rolling badly! Another rumor from the lot that popped up was regarding Under the Dome. From what I am hearing Under the Dome is looking good. Like really good. So good that they are already looking at a season 4. But will it stay in Wilmywood? Rumor has it that they are looking into how much it would cost to move it. Don’t be too alarmed though. This is pretty much standard. They did it last year as well. It’s business. 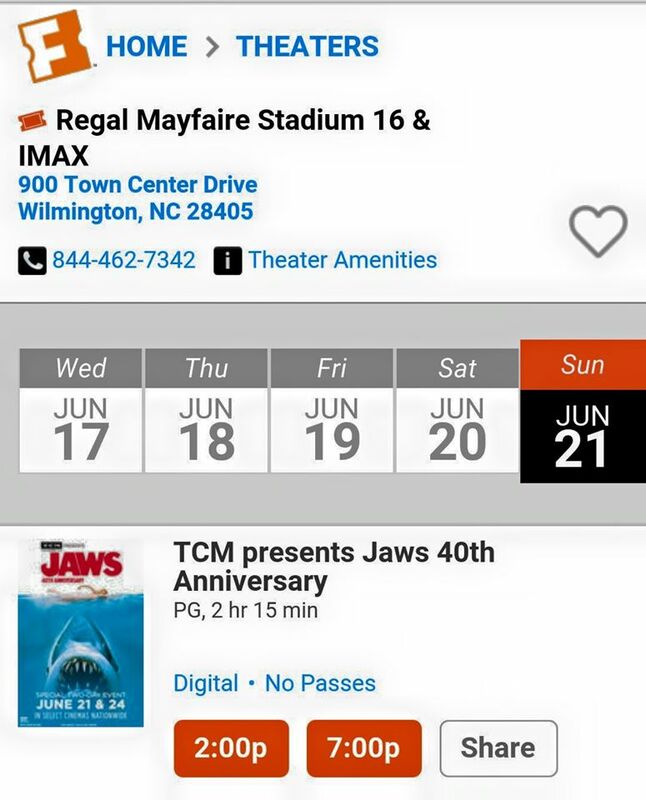 Oh and just for fun, the 40th Anniversary of Jaws is here! And as the Hollywood Reported stated, Jaws is ready to attack once again. It revisits theaters Sunday, June 21, and Wednesday, June 24, at 2:00 p.m. and 7:00 p.m. local time in theaters around the country. That includes Wilmington! Yay! That’s all I got for now. I will keep you posted!